Being a work at home mom can be anything but easy. This is even truer if you have little ones running around the house at all hours of the day while you’re trying to get work done! However, there are so many wonderful benefits to being a work at home mom, especially if your job is pretty flexible on the hours. 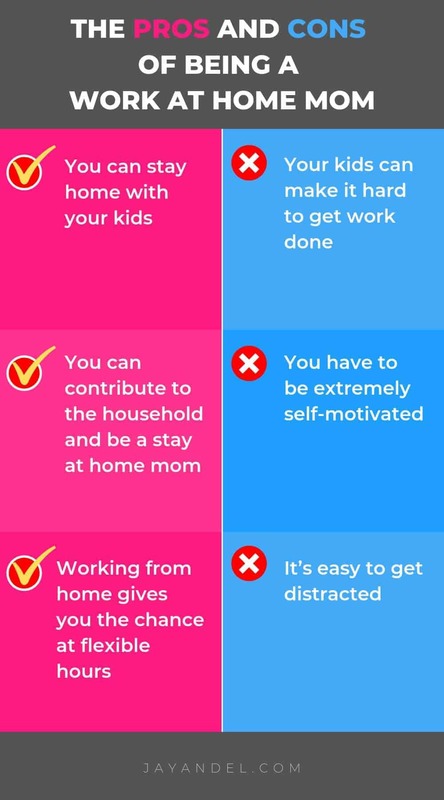 If you’re on the fence about whether or not to come home, here are the pros and cons of being a work at home mom. If you feel like you are missing out on some of the best years of your kid’s lives, or if you don’t want to have to pay for childcare, working from home can be a great option! Before your kids head off to school each day you can spend time with them, and be there when they get off the bus. If you have kids at home all day, it can be difficult to get work done. Work at home jobs usually have flexible hours, but you have to be able to sit down and actually get it done at some point. This can often mean late nights or early mornings to work around kid’s schedules. Read: How to keep your kids busy so you can work on your blog. One of the most stressful parts about deciding to be a stay at home mom is wondering if you will have enough money to get by. By working from home, you don’t have to choose! You can still contribute to your family’s monthly income and stay home with the kids. When you work from home, you will still have deadlines you have to meet. The difference is no one is going to come into your cubicle and tell you to get things done. In order to work from home, you need to be able to be extremely self-motivated. You have to be able to set your own work hours and stick to them. Many work at home jobs such as blogging, virtual assistant work, and even customer service jobs usually allow a little bit of flexibility about when you work. This means you can adapt your schedule and time off to work better with your family’s needs. It’s hard to not just stay in my pajamas all day and let the world pass me by. Distractions are a lot harder to snap out of when you’re working at home, and if your job is flexible on the hours, being distracted during the day can mean long hours at night. I hope this list has not only helped you decide if being a work at home mom would be the right choice for you but given you a sneak peek at what decisions we have to make as work at home moms. Best ways to keep your kids busy so you can finally work on your blog. As mom bloggers, we always need more content but lack the TIME to create all we need on our own.